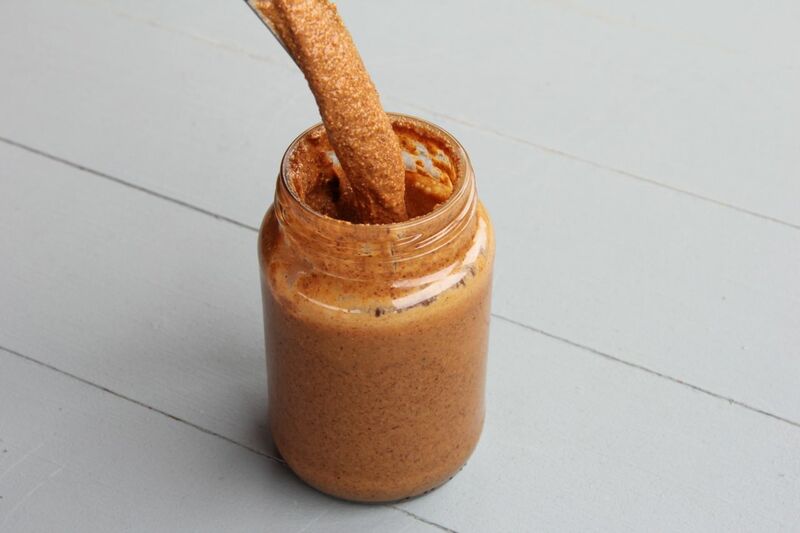 Almond butter is probably one of the most addictive nut butters out there. It is also one of the most expensive. Luckily, it is super easy to make at home – not only will that save you money, but you can ensure that no nasty additives were added to your nut butter. Preheat your oven to 180°C. Place almonds on a baking tray in the oven and roast for 5 minutes. Remove the tray and give them a stir every 2 minutes after that, until the almonds are fragrant and slightly browned. Do not roast them to the point of burning them as this obviously adds a nasty burnt taste and dries the nuts out too much. When the nuts are ready, pop them into your food processor and start pulsing. Once they are chopped, put the processor onto full speeds and keep scraping down every once in a while. After some time, the mixture looks like crumbs – keep going. Eventually it looks pasty and starts to form a ball. Use a spatula to push the ball flat so that the almonds make contact with the blades of your food processor and switch the processor on. While the blades are running, pour the oil and salt in. Do one tablespoon first, process, scrape, process etc. Only add more oil if needed. The longer you process it, the smoother it will become and it will EVENTUALLY become a perfectly smooth runny butter. The whole process may take about 20 minutes, depending on the strength of your food processor. Throw raw almonds into your food processor and just let it run. Every couple of minutes you can give your processor a little rest while you scrape down the sides and then continue processing. The nuts first become chunky, then floury and then it forms a hard ball that rolls around the inside of your food processor. Just keep going and it will eventually form a paste. At this point I find the butter is very hot and doesn’t seem to want to go runny and smooth immediately. Switch off the food processor and leave it alone for 20 minutes or longer. After that, when everything has cooled down a bit, switch the processor on again and you will see it turn into a smooth nut butter very quickly. If you are impatient, you can add a tablespoon or two of neutral oil while the motor is running. Otherwise, you don’t need the oil – it will sort itself out if you just keep going. Add optional honey or maple syrup while the motor runs.